You can use whatever colors and flavors you like when making this candy. You can make a rainbow assortment, and color-code each flavor: green for green apple, red for cherry, yellow for banana, etc. But you can make every batch the same color and flavor​ if you prefer! Line a baking sheet with a nonstick silicone mat or a layer of aluminum foil sprayed with nonstick cooking spray. In a medium saucepan over medium heat, combine the water, corn syrup, and granulated sugar. Stir until the sugar dissolves. Wash down the sides of the pan with a wet pastry brush to prevent sugar crystals from forming. Continue to cook the sugar syrup, stirring occasionally, until the thermometer reads 300 F (150 C). Remove the pan from the heat, and let the candy stop bubbling completely. 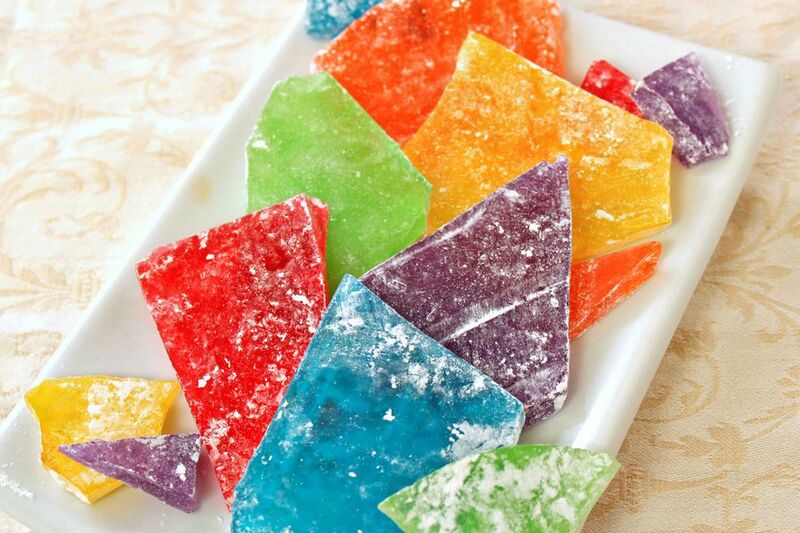 If you want to make two different colors and flavors of broken glass candy from one batch, pour half of the sugar syrup into a separate pan before you add the extract and food coloring. Work quickly and add different colors and flavors to the two batches, so that the candy does not start to set in the pans. Pour the candy out onto the prepared baking sheet and let it spread into a thin layer. Cool the candy completely at room temperature. Once it is set, pull it up from the sheet and crack it into small pieces by banging it against a cutting board or shattering it with a knife handle. Place the powdered sugar in a plastic bag and add the shards of candy. Shake the bag until the candy is coated with the powdered sugar. Store the candy in an airtight container at room temperature. The strength of extracts vary greatly from brand to brand and flavor to flavor. It may take a little trial and error to determine how much flavoring to add to suit your taste. If you are using flavoring oils, they are much stronger than extracts, so start by adding just 1/2 teaspoon flavoring oil. If kept well wrapped in a low humidity environment, this candy can last for several months and is great at room temperature, so it makes a wonderful gift, party treat, and favor.